Resort collections have hit the runways and I'm already day-dreaming of what I'll be wearing come December(ish). Living in California, I'm lucky not to have too hard of a time incorporating designers' transitional season offerings into my winter wardrobe. From work wear to vacation ensembles, the 2013 resort collections have you covered. Here's a sneak peak at some of the looks I'm currently coveting (and may actually be able to afford). Yigal Azrouel's 2013 resort collection does not disappoint. Azrouel's signature chic cuts are mixed with inspiration from Japanese gardens, making this collection filled with clothes perfect for the powerful woman who still wants to look pretty. See more looks here. 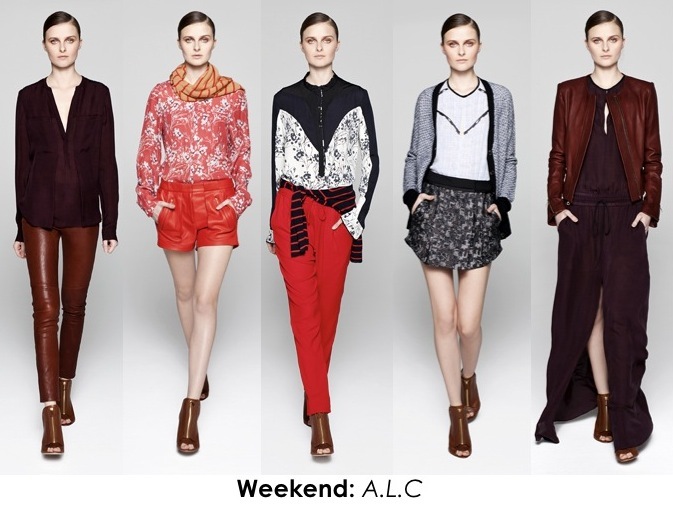 A.L.C designer Andrea Lieberman created a collection of wearable staples that are anything but average. Highlights include silky blouses with a western undertone, flirty skirts and pleated shorts, and ensembles in gorgeous shades of wine. What's not to love? I'm counting the weeks until I can call these clothes my own. View more here. BCBG Max Azria always has the perfect little something to jazz up vacation or date dressing, and their most recent resort collection is no exception. Lubov Azria was inspired by the idea of Italian jet-setters and showed everything from city-chic embroidered biker jackets to beach worthy kimonos. See the entire BCBG Max Azria resort collection here. thanks for stopping by and the sweet comments. Oh! I love that blue dress by Yigal Azrouel! I love BCBG. Awesome fashions. The vacation look with bcbg is just stunning. Loving the colors! love these especially the bcbg! nice post! loving the looks! all the collections are soo stunning! gosh these pants are amazing! Love the long leather coat in the first picture. Your blog is so great, you got a new follower! I'm in love with the BCBG collection! Those pattern pants are so cool, love the selection. Love your blog, and I love this collection. Everything is so amazing!! My first thought was how perfect I could mix and match it all up for travel!! Awww but to afford it all lol! Hope your having a wonderful day sweetheart! BCBG has some nice pieces there! Thank you for stopping by my blog earlier today! Affordable and stylish -- just what I'm always looking for. BCBG is one of my perennial friends, but the others are somewhat new to me. Will check them out. Thanks for the tip! p.s. love our profile bio! And thanks for the kind words on my blog. Happy to get introduced to you and your wonderful site. These clothes looks amazing, I love your blog!